This page is about all the beautiful women of the golfing world and dedicated to all those that love them. Each month a new "SC Golf's Lady Golfer of the Week" will be posted with a short write up. Who is your favorite female golfer; past or present, pro or am. Please contact me with suggestions! How do you define a triple threat? Some may say beauty, brains, and brawn while others would say fame, fit, and fun. Regardless of the combination of words you use to define the triple threat odds are, if you are talking about a female actress/golfer/fitness guru, you are talking about Nikki DiSanto. 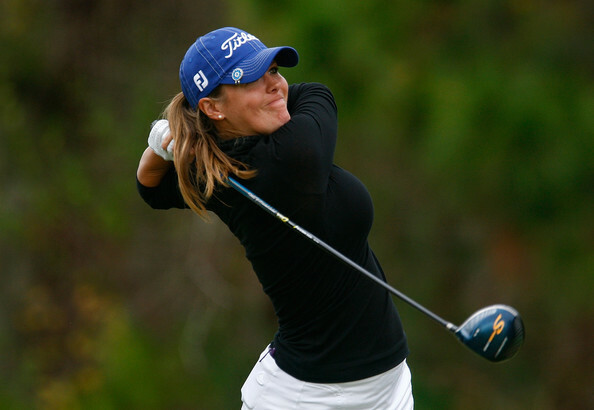 Nikkie studied at CSULA and became a professional golfer in 2003. Today, she is an actress, a golfer, and an innovative fitness guru! She has been featured on shows such as the Big Break, Golf in the Great Northwest, and has been on shows like C.S.I. and E TV. She is quite the competitor and it is obvious that she loves what she does. The passion she expresses for the love of her sport makes me want to practice harder and longer. She is fun to watch and a fierce competitor! Four-time NCAA All-American; 2006 Ladies British & Girls' British Amateur champion. she was the first player since 1972 to win both in the same year. During her freshman year at USC, she showed up for a video interview with the Daily Trojan wearing yellow pants and a blue shirt -- the official colors of UCLA. OUCH! In 2009, Blackwelder turned professional in May and finished 38th at the LPGA Final Qualifying Tournament to earn Priority List Category 20 for the 2010 LPGA season. In 2008, she qualified for the Jamie Farr Owens Corning Classic Presented by Kroger. Blackwelder enjoyed a successful amateur campaign, winning the 2007 Women's Western Amateur Championship, and finishing runner-up at the Trans-National Amateur Championship that same year. She's a two-time collegiate champion, winning once with the University of Kentucky (2005) and once with the University of Florida (2009), turning in eight overall top-10 finishes. Blackwelder was the 2004 American Junior Golf Association (AJGA) champion, and competed on the CN Canadian Women's Tour in 2009. Suzann started playing golf as a six year old and since then golf has dominated her life. She played her first tournament at the age of ten and she finished a good amateur career with victory in the World Championships in Berlin. She played on the European Tour for two years and in 2003 She started playing on the LPGA. Her goal is to keep delivering top performances, to get the best out of every day. Visit the link above to visit Suzann's website. We typically devote a couple of paragraphs to our featured Lady Golfer of the Week. However, after learning about Stacy Lewis and everything that she has overcome in order to play golf we decided to devote a little more time and energy into sharing this amazing story with you! Ask any golf writer in the country about the best story in women's golf, and chances are they will say: Stacy Lewis. It isn't just because she has been the best amateur player in the country over the past 2 years, or because she was the 2007 NCAA champion, or even because she has won 12 tournaments at the collegiate level while putting the University of Arkansas' women's golf program on the map. It isn't because in her last event as an amateur, at the prestigious Curtis Cup held at the Old Course at St. Andrews, Stacy became the first person in the 76 year history of the Curtis Cup to post a 5 - 0 record while leading her US team to an historic victory. And it isn't because in her first tournament as a professional at the US Open 2008, the most prestigious of majors, she lead the star-studded field after the 3rd round and played in the final group with Paula Creamer, where she managed to finish third. Stacy Lewis is the best story in women's golf because of the things that she's had to overcome in order to just play golf again. 7 1/2 years in a back brace and back surgery, after which she wasn't sure she would even be able to walk, let alone swing a golf club again. We can't help but like Stacy because she's earned everything she's ever won, and then some. She embodies those values that we most cherish: fiercely competitive yet considerate, tremendously talented yet seeks betterment through hard work, intelligent without being condescending, confident without being self absorbed and incredibly irrepressible no matter what obstacles are before her. 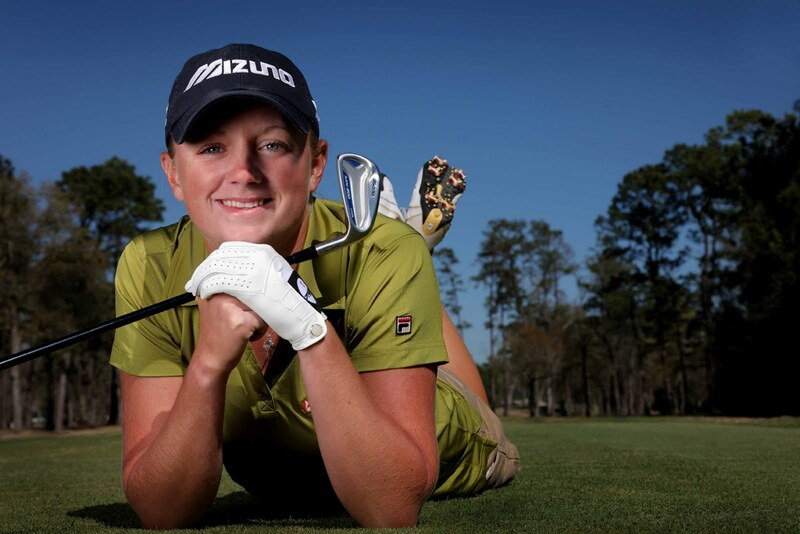 In many respects, Stacy Lewis is who we would like to be as an American people. Paula Creamer (born August 5, 1986), nicknamed the "Pink Panther", is an American professional golfer who plays on the U.S.-based Ladies Professional Golf Association (LPGA) Tour. In her four seasons as a professional, she has won 10 tournaments, including eight LPGA Tour events. Creamer has been as high as No. 2 in the Women's World Golf Rankings, and as of June 2009 is the No. 3 female golfer in the world. Blair began her journey to success on the golf course at the age of 13 and instantly realized that golf was more than just a sport. It was a way of life... She went on to play at Arizona State University. Today, Blair is has successful combined her two passions, modeling and golf, and has been featured by Sports Illustrated as one of the "Worlds Hottest Athletes"! Aubrey McCormick was born in Orlando, Florida and is a graduate of Missouri State University. In 2000, an 18 year old Aubrey started playing the game of golf and within a year earned a full golf scholarship to college. Aubrey turned professional in 2007 and is competing on various mini tours such as the Suncoast Tour and has status on the Duramed Futures Tour. Today, Aubrey is working toward making the LPGA, being a positive role model, and building a business to help others and the environment. Aubrey believes in a “green” lifestyle, on and off the golf course. Natalie Gulbis was born in Sacramento, California and is a graduate of the University of Arizona. In 1996, a 13 year old, Natalie finished in second place in the California State Women's Amateur tournament. Today Natalie is a world renown LPGA golfer. Natalie was awarded the 1998 U.S. Women's Amateur medal. For obvious reasons, she also models. Hee Kyung Seo joined the KLPGA in 2006 and has continued to compete in KLPGA events to the present. She has competed in several LPGA event to date and her best finish, T-15th, was at the 2009 Kolon-Hana Bank Championship, SBS Open. She is known as the Supermodel of the Fairways. Michelle Wie started golfing at a little over four years old in her home state of Hawaii. Her father, B.J. Wie, started teaching her. By the time she was 11, Michelle was regularly winning most of the amateur tournaments she played in and was even playing better than most men. Michelle became the youngest person, and just the fourth female, to play in a PGA tour event, when she teed off at the Sony Open on January 15, 2004. 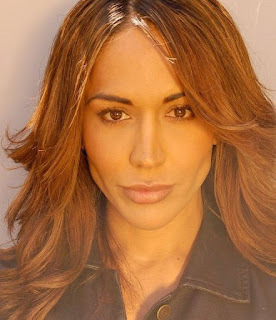 Cristie was born in Miami, FL and began her professional career in 1997 (straight out of High School). She has 12 career wins to date, including the 2007 US Women’s Open Championship. She also had 8 Amateur and Junior Golf Accomplishments. Erica picked up her first golf club at the age of five, and has been hitting the links ever since. She quickly made a name for herself in the golfing world and became a professional in June of 2004. She is a resident of Corona, California and a graduate of the University of Arizona. Anna Raswon is the first SC Golf's Lady Golfer of the Week. She is a graduate of USC (California), a model, and obviously a golfer. In 2008, she became a member of the LPGA and has continued to dedicate her time to the improvement of her game.